In lieu of making a birthday card, I’m embellishing the envelope instead and putting it into this shadowbox as a keepsake for Mom. It’s fairly easy to design and print an envelope with a home printer and Microsoft Word; it just requires a bit of customization for the margins and page setup. (I still use the old Word 2003). For the page setup, I measured the size of the envelope ( I included the height of the opened flap). In word (file/page setup) I clicked on the paper tab and typed in the measurements for the width and height. Envelopes have to be fed through the rear paper slot of your printer since they are a custom size, so don’t forget to change the paper source to ‘rear paper feed slot‘ while you’re at it. Next, set the margins. The envelope flap I was 2.5″ high so I set my top margin to 2.5″ so nothing could print above that margin (represented by the dotted line shown below). I then set the rest of the margin settings to .12. Once the settings are done, go ahead and type/format the message. Choose a size and style of font that looks good to you (I used Aardvark). I designed my envelope in black and white, but you could choose to do yours in colour if you prefer. Insert the envelope into the rear feed slot: be mindful of which end goes in first and whether the paper needs to face up or down. For my Epson printer, the flap went in first and the paper was face up. Click on print, then choose properties. Choose ‘envelope’ for paper type and select rear paper feed slot as the paper source (sometimes you have to change it here too). Now for the finishing touch – the scrabble tiles; place a ruler over the envelope to act as a straight edge where you want to place them. I used antique irons as weights on either end to keep the ruler from shifting as I worked. I centred the word ‘eighty’ and spaced out each letter leaving 1/4″ gape between letters (I ended up with 3/4″ on either end). I lifted each tile and placed a piece of clear double-sided tape on the back, then pressed it into place on the envelope. 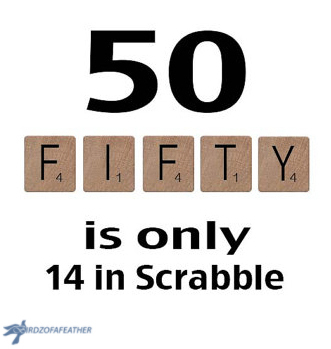 Note that not all scrabble tiles are made alike; some of them have a nice varnished finish and others are still pretty rough. I would suggest using a stronger double-sided tape than the one I used if your tiles are raw wood (I couldn’t find my better roll of tape and Mom’s birthday is tomorrow)! I was able to make it work because I chose tiles that were varnished and the flimsier tape gripped perfectly to them. The shadow box I used has a magnetic catch so I just popped it in and fastened it to the background with the pins provided. Mom can just reach in and grab the envelope to open it up and read the card (leave the flap unsealed if you don’t want Mom to accidentally tear your hard work). By the way, this idea would work for any milestone birthday and could easily be adapted for anyone – like the ’50’ example below! If you have parents that have reached a milestone birthday, I’d love to hear how you celebrated them. Let me know in the comments. and this bathroom vanity makeover…. Get your DIY mojo on at Birdz of a Feather and subscribe if you don’t want to miss another unique idea! Follow us via Bloglovin’ (button the post) or here (link in the footer). You can also follow us on Pinterest, Facebook, YouTube and Instagram. You’ll find home and garden DIY ideas on the home page too. What a clever gift for your mom. I love it, Sara. This idea could be used in so many different ways; I love it. Of course I love Scrabble also, and hope that I can find someone selling a bag of the tiles. I would never destroy one of my 3 sets. As for memory loss, I’m sure that some days are better and the mind is sharper too. I love this, it’s fantastic.